Q. What is a designated Transit Village? A. A designated Transit Village is a municipality that has been recommended for designation by the interagency Transit Village Task Force. These municipalities have demonstrated a commitment to revitalizing and redeveloping the area around their transit facilities into compact, mixed-use neighborhoods with a strong residential component. A municipality can be designated a Transit Village only after much of the planning and background work has already been done on the municipal level. It may only be designated a Transit Village after the Transit Village Criteria have been met. Q. How many designated Transit Villages are there? A. There are currently 33 designated Transit Villages. They are Pleasantville (1999), Morristown (1999), Rutherford (1999), South Amboy (1999), South Orange (1999), Riverside (2001), Rahway (2002), Metuchen (2003), Belmar (2003), Bloomfield (2003), Bound Brook (2003), Collingswood (2003), Cranford (2003), Matawan (2003), New Brunswick (2005), Journal Square/Jersey City (2005), Netcong (2005), Elizabeth/Midtown (2007), Burlington City (2007), City of Orange Township (2009), Montclair (2010), Somerville (2010), Linden (2010), West Windsor (2012), East Orange (2012), Dunellen (2012), Summit (2013), Plainfield (2014), Irvington Township (2015), Borough of Park Ridge (2015), Hackensack (2015), Long Branch (2016) and Asbury Park(2017). Q. What is the difference between a Designated Transit Village and a transit-oriented development (TOD)? A. A Designated Transit Village is a municipality that has been deemed by the Transit Village Task Force and the Commissioner of Transportation to have met the Transit Village Criteria. The area that makes up the Transit Village district is a half-mile radius around the transit station. In order to be designated a Transit Village, the municipality must document that there are multiple TOD projects planned for the area within the district. Q. What are the benefits of becoming a Designated Transit Village? State of New Jersey commitment to the municipality's vision for redevelopment. Coordination among the state agencies that make up the Transit Village Task Force. Priority funding from some state agencies. Technical assistance from some state agencies. Eligibility for grants from the New Jersey Department of Transportation (NJDOT). Q. What is mixed-use development? 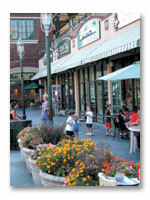 A. Mixed-use development is characterized by more than one use in a single building, development or neighborhood. An example is a five-story building with shops and stores on the first floor, offices on the second floor and apartments on the fourth and fifth floor. Another example is a residential block with a deli on one corner and a doctor's office on the other corner. The objective of mixed-use development is to increase housing opportunities within walking distance of shops, jobs, offices, restaurants, entertainment and cultural centers. By increasing opportunities for pedestrian activity, municipalities reduce reliance on automobiles, reduce traffic congestion and pollution, boost the local economy and improve the feeling of safety and security. Q. My municipality has met some of the criteria. Whom do I contact if we need additional planning assistance around the transit station? A. Municipalities that need to meet the Transit Village Criteria have several options for planning and visioning the area around a transit station. NJ TRANSIT can provide consultant assistance to municipalities interested in initiating a planning effort for a transit station area. NJ TRANSIT has published a handbook entitled "Planning for Transit-Friendly Land Use," designed to assist citizens, local officials and planning professionals interested in improving the coordination between land use planning and transit. Contact Vivian Baker at NJ TRANSIT for more information by e-mail or at 973.491.7822. The Office for Planning Advocacy within the Department of State offers technical assistance for planning, redevelopment and zoning issues. For more information call the office at 609.292.7156. A municipality should also reach out to its county planning department to explore planning studies and other assistance that may be available. Q. What state agencies make up the Transit Village Task Force? A. Along with NJDOT and NJ TRANSIT, eight other state agency partners make up the Transit Village Task Force. They are the Council on the Arts, the Department of Community Affairs, the Department of Environmental Protection, the Economic Development Authority, the Housing and Mortgage Finance Agency, the Office for Planning Advocacy, Main Street New Jersey and the Redevelopment Authority. The Transit Village Task Force meets six times per year. The Task Force members work together to direct state funding into the designated Transit Villages to help achieve the redevelopment goals of the municipality. Q. The Transit Village application requires transit-supportive site design guidelines and architectural design guidelines. Are examples available? A. Yes, NJDOT has compiled a Manual of Best Practices for Transit-Oriented Development that contains many good examples of transit-supportive zoning language and design guidelines that can be tailored to fit any municipality. Q. Whom should I contact for more information? A. If you have additional questions or think your municipality has met the criteria for Transit Village designation, you should contact LeRoy Gould, NJDOT Transit Village Coordinator by e-mail or 609.530.3864.